Ukraine's President Petro Poroshenko has accepted the resignation from military service of Defense Minister Stepan Poltorak who will continue leading the ministry as a civilian. 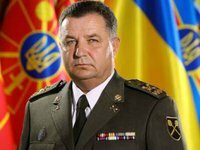 "Stepan Tymofiyovych Poltorak has written a letter of resignation, and honestly, it was with a very heavy heart that I accepted this letter about the resignation of the Ukrainian Army General Stepan Poltorak from military service," Poltorak said during festivities honoring the Ukrainian military in Kyiv on Saturday. By law, the ministry must be led by a civilian starting from January 1, 2019, he said. "Appreciating... Stepan Poltorak's contribution to the revival of the Ukrainian Armed Forces and, before that, the restoration and formation of the National Guard of Ukraine, I made the decision so that he continues leading the Defense Ministry, only as a civilian minister now," Poroshenko said.